Cfctruth: Planning a Bridge of Size? Planning a Bridge of Size? This tallies with the previous statement of the CPO Board in which it was suggested that the consultants would return in the ‘autumn’ with ‘more concrete proposals based on the feedback received from this initial consultation’. At this point it might be worth noting that we are slightly surprised that more hasn’t leaked out regarding the specifics of the consultation beyond what the CPO Board have already stated. Does this suggest that everyone involved has been super tight-lipped so far? Or perhaps that the consultation has been highly targeted rather than truly comprehensive? Probably the latter, we think, but that need not be a problem providing the right people are being consulted and the right questions are being asked. The previous statement from the CPO Board gives us confidence that this is the case. Now, in the past week, the club appear to have leaked further information about their plans by means of a private briefing with various members of the press just before the club’s latest accounts were released. As usual, it is fairly simple to spot that a flurry of press coverage is as a result of a club briefing rather than the usual press twaddle because each of the resulting stories take the same basic line and they all repeat key soundbites. That was certainly the case this time. So what can we confirm from the briefing? That the club (or perhaps Roman himself) ‘are intent on staying at Stamford Bridge and developing it’ although ‘local authorities have drawn the club's attention to Old Oak Common, where Queen's Park Rangers are now planning a new ground, and the Olympic Stadium.’ Another piece states that the club ‘would prefer to stay as close as possible to its current Stamford Bridge site’ which is of course subtly different to ‘staying at Stamford Bridge and developing it’ but most of the papers agree what the club’s preference is now. Even if the club agreed to start work on the project tomorrow they estimate that it would take up to seven years until they could start playing in a redeveloped stadium due to the length of time it will take to navigate planning issues and construction. This far from surprising. Arsenal took almost eight years from their initial announcement to the opening of the Emirates. Spurs new stadium has taken six years so far and will take at least nine to complete. And the Stamford Bridge development is likely to be even more controversial and difficult than either. Stamford Bridge currently generates £1.5m-£2m less per match than Arsenal does which adds up to over £35m less a season in matchday revenue. The club may be managing the FFP landscape brilliantly but £35m-£40m a year is still a lot of cash (over seven years something around a quarter of a billion). And of course, based on Gourlay’s first statement above, the club sees a bigger stadium as the key that would increase the fanbase and unlock more long-term commercial income too. The club has estimated that it would cost £20,000 per seat to raise the capacity to 60,000 which suggests an overall project cost of around £364m. This figure is significant (see below). The club ‘admit that overhauling the Bridge does not make conventional business sense, with a listed building and a cemetery amid the impediments, though the level of the water table is not quite such a problem as had been thought’. Overall ‘the club estimate that it would take 25 years to make a profit out of the new seats’. The cost must be enormous, the obstacles even bigger so no wonder the plan doesn’t make business sense. And what is this listed building by the way? Oswald Stoll? The Artists’ Studios on Fulham Road? The East Stand, even? None of these are listed according to LBHF or English Heritage. Twickenham is still seen as an option for temporary relocation while construction is underway but it would probably be for two seasons rather than one. There is no desire from the club to make Twickenham our permanent home. Good, although we do hope the club have a back-up plan. The club believe that an increase in capacity would allow them to take steps to improve the atmosphere at Stamford Bridge through ‘experimenting with the sale of tickets’. This is not the place for a discussion on this point but the club would certainly have to offer some discounted tickets in order to sell out a 60,000 stadium against clubs like Hull and West Brom. But don’t expect cheaper tickets when we play the likes of Arsenal and Liverpool. Again this is not for discussion here but it is also worth noting that, according to the briefing, the club have ‘sanctioned the Premier League chief executive, Richard Scudamore, to examine the idea of the League's sides playing a 39th game overseas’. The club apparently feel that ‘feel that the ambition to nurture overseas fans through a 39th game is acceptable.’ Hmm. So what is the club telling us? Quite a lot as it happens. Firstly, it now seems quite clear to us that the club is determined to redevelop Stamford Bridge - assuming this is technically feasible. Regular readers will know that CFCtruth has written extensively about the possibility of the club moving to a new location and we know these were live options at various points. Now, however, based on both the briefing and a lack of movement elsewhere (Earls Court in particular) these possibilities all seem to be firmly closed. The club has apparently moved on and perhaps the time has come for this blog to move on too (that is, of course, unless all the words coming from the club are an elaborate feint – but we are doing our best to rein in our innate scepticism). Now we know some people view CFCtruth as a pro-move blog but this has always been incorrect. What we are is pro-club and pro-ambition but also very much anti- the misinformation that has led to the club missing out on certain superb opportunities. We have also tried to ensure that LBHF's activities and weasel words were laid out for all to see (particularly with Earl's Court) so that fans were able to apply pressure to the council if they chose to. But if the club can somehow make a redevelopment at the Bridge happen, with both the help and support of the new administration and the residents (still highly controversial) then no one will be happier than us. Chelsea’s location is unique in world football and the club would be mad to throw that away for a second-best option if the best possible option is achievable. As noted above, we consider the ‘£20,000 per seat’ figure, the consequent £364m project cost and the one or two year construction period cited above to be significant. Looking back at the Future of Stamford Bridge report from 2012, it is stated that a 60,000 new build stadium would cost over £600m and would take three years to construct. So, based on that it seems clear that what is being considered by the club in these plans is not a new build on the Stamford Bridge site. Another section of the Future of Stamford Bridge report also caught our eye. 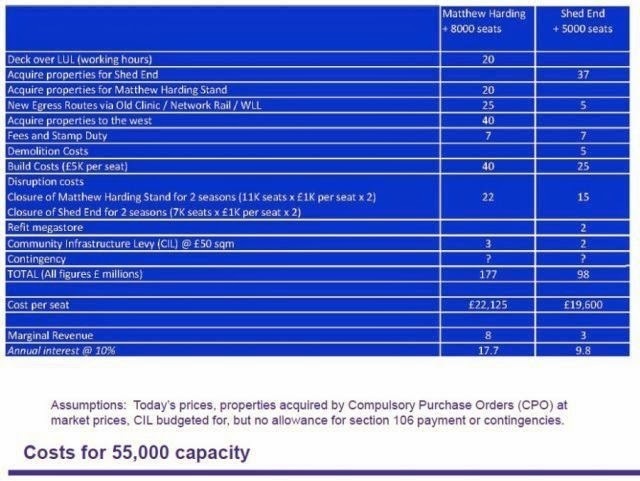 The proposed costs for the redevelopment of the Matthew Harding and the Shed to increase the overall capacity of Stamford Bridge to 55,000 is estimated in the report at £275m and notably the cited cost per seat is around £20,000. Taking into account inflation since 2012 could the suggested £364m project cost be based on this template? Perhaps the additional cost would allow the project to squeeze a further 5,000 seats in somewhere to bring Stamford Bridge up to the magical 60,000 capacity which the briefing suggests the club remains firmly wedded to. That said, we have heard vague rumours from elsewhere that the project might involve keeping the West Stand as it is and rebuilding each of the other three stands – the new East Stand being built over a decked over railway line. Could the suggested £364m project cost accommodate a new East Stand too? That is debatable but it would make sense financially for the club as even if a new East Stand would only add 2,000-2,500 to overall capacity (as the FoSB report suggests) there is huge potential for improved corporate facilities in the stand. Whatever is eventually proposed, it seems certain that the club would have to acquire surrounding properties in order to accommodate, if not the stands themselves, but the necessary exit routes. This is bound to include a new exit north of Stamford Bridge along the route of the railway line which will require decking over the tracks and which will include a new “green north-south cycle route past the stadium”. And despite the initial club statement suggesting any development would be ‘within the existing historic site boundaries’ it may well also need to incorporate the Sir Oswald Stoll mansions too which would require a uniquely sensitive approach in order to succeed. So what’s going to happen next? Well, based on the CPO Board statement, it seems highly likely that the club will make one or more new announcements about the stadium relatively soon. However, we shouldn’t expect a full planning application just yet. Instead the club are much more likely to first announce their firm intention to redevelop Stamford Bridge (something along the lines of this statement by Tottenham) after which they will move into an intense period of pre-application consultation. This means formal discussions with the council and the LBHF planning department would begin (though we are sure that informal talks have already taken place) along with discussions with various statutory authorities and stakeholders such as the Mayor of London, English Heritage and Transport for London. Additionally, and most exciting for us supporters, this period will almost certainly include extensive public consultations incorporating some kind of public exhibition of the club’s stadium redevelopment plans. No doubt we will also see the proposals resulting from the current consultation about the public space in Fulham Road and around the stadium. The actual planning application itself, assuming it will follow, may not happen for another year in order to give the club time to complete the various consultations and to weigh up the results. Because now the club seem to have firmly tied their colours to the Stamford Bridge redevelopment mast, nothing about this project will happen quickly. There remain numerous obstacles in the way of a Stamford Bridge redevelopment and the long hard road ahead will prove extremely challenging and arduous. But the prize at the end of the road – perhaps as long as a decade in the future – promises to be one which every Chelsea fan can celebrate. Im sure we are all excited/nervous/impatient about this build/move whatever but lets just hope its going to be big enough that when it is actually finished in 7/8/9 years time so we dont have to go through this again. With the standard of te top grounds in England and across Europe even with a 60,000 capacity we wont be anywhere near the top of the list. And as wit the speed te team is progressing and IF Mou develops us like it looks like he will then we are going to be a team to reckon with for years to come. Will it be to a standard that we dont have to go through it all again? I think this is a perfect time for the safe terraces debate.Even if its just the Shed and MH it would mean almost doubling their capacity and cheaper. Anyone that follows Chelsea in Europe has come across this and its an excellent idea. Is this all really realistic? Presumably Labour have bottled the big Earls Court ruckus they promised before being elected?